Honda's Amaze sub 4 meter sedan has opened up competition to Maruti Suzuki Dzire, Toyota Etios, Chevrolet Sail sedan and even for Tata Motors Manza sedan. Whereas Maruti Suzuki fought back by launching Dzire Regal - Limited edition variant, Tata Motors has compared Manza Vs Amaze sedan and shows how Manza sedan is better than Amaze. The comparison is already available at Tata Motors website. If we go just by comparison, whose screen shot is already here, there is not a whiff of doubt that masses would not prefer Manza sedan. The reason is Manza being a full length sedan at 4413mm is much bigger than Amaze. Even in terms of wideness and height, Manza scores way ahead of Amaze along with complete 60 Liters more boot space. Overall, Manza offers much much more space than the already spacious Amaze. If we come to features, Manza sedan offers features like Touchscreen music system, 6 speakers, Voice assisted GPS, Bluetooth, ABS + EBD and various other featues which Amaze lacks. Over and above, when you get a buyback offer after 3 years of using the car with 60% of money back, no one would like to miss the wonderful opportunity. 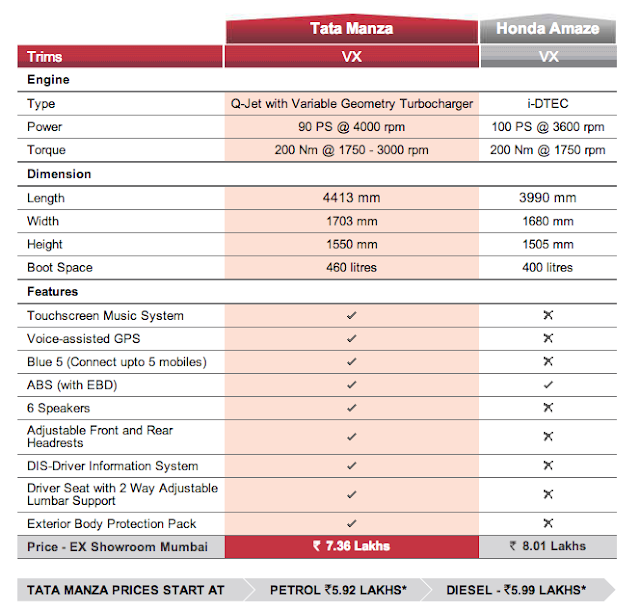 Not to forget, Manza comes at cheaper price tag than Amaze despite of offering more space and better features. However, the final question, Will Manza spoil Amaze's amazing party ? Will customers prefer Manza over Amaze ? The answer would be "No". Over the time, Honda has been able to make its reputation in market in terms of customer's preference for Honda sedan. This is also clear by Honda's sales in last year, which is much more than all sales of Manza. We have previously also seen Tata Motors comparing their Vista hatchback with Maruti's Swift - however swift emerges to be a clear winner.